© 2018 Gupta E, et al. This is an open-access article distributed under the terms of the Creative Commons Attribution License, which permits unrestricted use, distribution, and reproduction in any medium, provided the original author and source are credited. Many studies have shown the association between acute kidney injury (AKI) and morbidity and mortality in the Intensive Care Unit (ICU). Traditional measures of AKI, such as serum creatinine and urine output, fail to show dynamic changes in renal function. A feasibility study was performed to evaluate the Nephrocheck® test system which comprises of two biomarkers (Insulin-like growth factor binding protein 7 (IGFBP7) and tissue inhibitor of metalloproteinases-2 (TIMP-2)) to screen for patients at risk for AKI in the ICU and to guide management. Twenty patients were enrolled. Six (30%) patients developed AKI during first week of ICU stay. All six patients had initial Nephrocheck® values ≥ 0.3 that subsequently increased with the second Nephrocheck® test at 24 hours. Seven patients had normal Nephrocheck® values on admission and did not develop AKI. Interestingly, seven patients who had initial Nephrocheck® values ≥ 0.3 that decreased at 24 hours did not develop AKI. 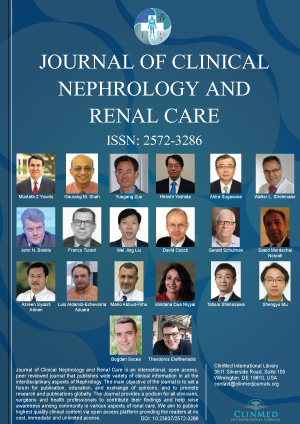 The trend of the Nephrocheck® values was more significant than the initial value for the development of AKI. The Nephrocheck® test may be used as an early indicator of development of AKI. However, further studies are needed to determine if nephron-protective interventions can be helpful in mitigating this risk. Ena Gupta, MD, MPH, Division of Pulmonary and Critical Care, Jane and Leonard Korman Respiratory Institute, Jefferson Health and National Jewish Health, Thomas Jefferson University, 834 Walnut Street, Suite 650, Philadelphia, PA 19107, USA, Tel: 215-955-1671.